Richard SCOTT Sr. (1605 – 1680) was Alex’s 10th great grandfather, one of 2,048 in this generation of the Miner line. Richard Scott was born 9 Sep 1605 probably in Glemsford, Suffolk, England. His parents were Edward SCOTT and Sarah CARTER. He married Katherine MARBURY on 7 Jun 1632 in England. He emigrated in 1634 on the “Griffin” and was admitted to the church at Boston, 28 Aug1634. There is no record known of Richard Scott’s death, but from collateral evidence he is supposed to have died quite suddenly in the latter part of 1680 or early in 1681, leaving his affairs in considerable confusion. Katherine Marbury was born about 1610 or 1617 in Alford, Lincolnshire, England. Her parents were Rev. Francis MARBURY and Bridget DRYDEN. Katherine died on 2 May 1687 in Newport, Rhode Island. Richard Scott was one of the first Quakers in the Rhode Island colony. He received a bequest from his brother, George Scott, of London, merchant, in his will dated September 9, 1640, and proved April 22, 1642, in which reference is made to their father, Edward Scott, of Clemsford, county Suffolk, England. (See New England Genealogical Register, page 254, Vol. LI). Richard was a shoemaker by trade. He came over in 1634 on the ship “Griffin” and was admitted to the church at Boston, 28 Aug 1634. Katherine Marbury ‘s mother Bridget Dryden was sister of Sir Erasmus Dryden,1st Baronet (1553–1632) grandfather of the poet John Dryden. If I count my relatives correctly that makes them second cousins once removed. John Dryden was also a second cousin once removed of Jonathan Swift. Katherine’s father was a London clergyman, Rev. Francis Marbury. 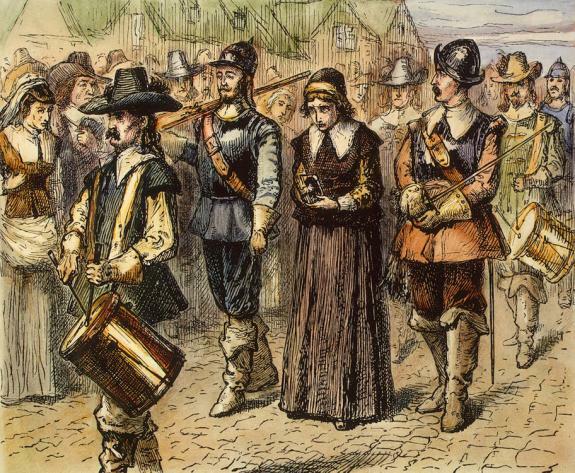 However, Katherine’s most relevant famous relative was her sister Anne Hutchinson, who also run afoul of the Puritan leaders in Massachusetts. Anne Hutchinson figures prominently in an excellent book I just finished, The Wordy Shipmates by Sarah Vowell. Richard removed in 1634 to Ipswich and before 1637 to Providence, Rhode Island. 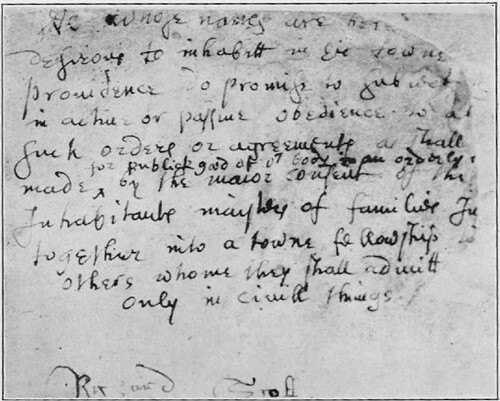 20 Aug 1637 – Richard signed the famous Providence Compact. Roger Williams established a settlement with twelve “loving friends.” He called it “Providence” because he felt that God’s Providence had brought him there. He said that his settlement was to be a haven for those “distressed of conscience,” and it soon attracted quite a collection of dissenters and otherwise-minded individuals. From the beginning, the settlement was governed by a majority vote of the heads of households, but “only in civil things,” and newcomers could be admitted to full citizenship by a majority vote. In August of 1637 they drew up a town agreement, which again restricted the government to “civil things.” In 1640, another agreement was signed by thirty-nine freemen, which declared their determination “still to hold forth liberty of conscience.” Thus, Williams had founded the first place in modern history where citizenship and religion were separated, a place where there was religious liberty and separation of church and state. 1655 – Scott was admitted a freeman. He and his family were constantly subjected to religious persecution. 27 Jul 1656 – Richard’s future son in law, Christopher Holder landed in Boston, aboard the Speedwell.. He and seven other passengers were listed with a “Q” (for Quaker) beside their names, because at that time, the Puritans in England and in the English colonies were persecuting Quakers, members of the Religious Society of Friends. The port authorities were alerted to the presence of the Quakers and searched the ship before anyone disembarked. Governor John Endicott ordered that they be brought directly to court. Holder and another member of the group, John Copeland, displayed a thorough knowledge of the Bible and the law as they testified in court. Holder was put in jail to await the next available ship to take them back to England. While they were still in the jail, Mary Dyer and Anne Burden, two other Friends, arrived in another ship and were arrested on the spot. The authorities in the Massachusetts Bay Colony considered the teachings of the Quakers both heretical and blasphemous. They apparently wanted to put Quakers on alert that they were not welcome there. Eventually Holder and the seven who had come with him were deported to England. 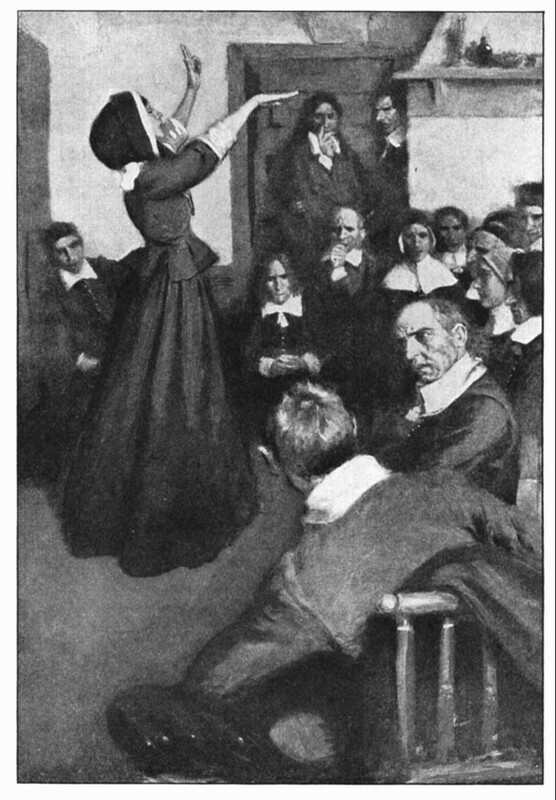 When Mary Dyer returned to Boston, protesting the harsh laws against the Quakers, she was arrested again. Once more, she was sentenced to hang. Mary bravely went forward and was hung; her neck snapped and her lifeless body dangled in the wind. Dyer’s dress billowed with the breeze. A weeping bystander remarked: “She hangs there as a flag for others to take example by.”11And yet, amidst the persecution and death, a new life flourished. our ancestor Edward WANTON, an officer placed under the gallows to protect the structure was “so affected at the sight” of Mary’s courageous sacrifice “he became a convert to the cause of the Friends [Quakers].” Three years later Wanton was arrested in Boston for holding a Quaker meeting in his home. Holder was determined to return to New England and went to George Fox, one of the leaders of the Friends, for help in securing passage on another ship. Holder and Copeland traveled back to Massachusetts together. This time around, Holder was actually able to preach to people, and many responded favorably. In the town of Sandwich several people became convinced of the truth of the Quaker message and adopted those beliefs and practices themselves. A small band of Friends had already been meeting for a few months when Holder arrived, under the ministry of Nicholas Upsall, a new Friend who was in exile from Boston. Holder and Copeland were jailed for their activities in Sandwich, and the Friends began meeting secretly in a place that was called “Christopher’s Hollow” in Holder’s honor. The hollow is still known by that name. Holder and Copeland made their way throughout several towns in Massachusetts. Wherever they preached, some people were convinced. Holder then made his way to Salem and attended a service at the Salem Congregational Church, the very church where Governor Endicott worshiped. Endicott’s men seized Holder and stuffed a glove and a handkerchief down his throat. Another member of the church, Samuel Shattuck, rescued Holder from this treatment. Holder and he were friends from that point on. Holder, Copeland, and Shattuck were put in prison. Shattuck was released on bond. The two visitors were given thirty lashes. After several months in prison, they were released. Holder’s hosts, Lawrence and Cassandra Burnell Southwick, were put in jail for associating with him. Lawrence was released, because he was a member of the church. Cassandra remained for a few weeks and was then fined for possessing a paper written by the Friends. 16 Apr 1658 – Holder and Copeland returned to Sandwich, but were arrested by a delegation sent by Endicott. This time they were given 33 lashes. 3 Jun 1658 – The two Friends went to Boston, where they were immediately arrested. This time, Holder’s right ear was cut off to punish his “heretical” preaching. 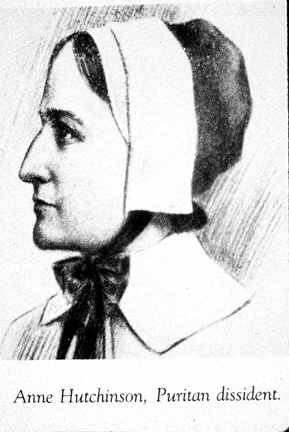 Katherine Scott, the sister of Anne Hutchinson and future mother-in-law of Holder, protested. Because she stood up for Holder and his companion, she was put in prison for two months and given 10 lashes. June 1659 – Two Friends, William Robinson and Marmaduke Stephenson, felt called to go to Massachusetts, although a new law imposed the death penalty on Friends. Richard’s daughter, Patience , only eleven years old at the time, went to Boston as a witness againt the persecution of the Quakers, and was sent to prison; others older being banished. This prompted Mary Dyer to return and protest their treatment. For this action, she was put back in jail. Dyer was released after her husband wrote a letter to Endicott. 12 Sep 1659 – All of the Quakers were released from prison and banished, under pain of death. Robison and Stephenson stayed and continued to preach. They and Holder were put back in prison, prompting three women—Mary Dyer, Hope Clifton, and Holder’s future wife, Mary Scott—to come and visit them and plead for their release. Dyer was arrested yet again for speaking to Holder through the bars of his cell. Abd Mary was herself made a prisoner and detained a month. “What whipping at Boston could not do, conversation with friends in England and their arguments have in great measure drawn her from the Quakers and wholly from their meetings.” . Scott was a deputy to the general assembly in 1666. He was an earnest Quaker. In a letter published in 1678 in George Fox’s book, A New hugland Firebrand Quenched,” in answer to Roger Williams’ “George Fox Digged Out ot His Burrow,” Scott arraigns the petty vanities of Williams. In Bodge’s ” Soldiers in King Philip’s War,” the name of Richard Scott appears in such manner as to make quite certain the presence of two persons bearing that name. In those accounts, Richard Scott, cornet, and Richard Scott, private, were both paid for services, Aug. 24, 1676. The services extended from December, 1675, to Aug., 1676. , 1676. Richard Scott, the younger, who is mentioned, but not named, in his father’s letter to George Fox, perished, unmarried, in the war. Mary’s husband Christopher Holder (Wikipedia) was born 1631 in Gloucestershire, England. After Mary died, he married 30 Dec 1665 in Newport, Newport, Rhode Island to Hope Clifton (b. 1644 in Rhode Island – d. 16 Jan 1681). Christopher died 13 Jun 1688 in Portsmouth, Newport, Rhode Island. In 1909, Holder descendant Olivia Slocum Sage (the widow of Russell Sage) donated a dormitory at Princeton University, which was named in honor of Christopher Holder. The building is a Gothic-style quadrangle located on Nassau Street at the extreme northwest corner of the campus. A tablet notes the memorial to Holder; it is embedded in the building’s facade.. In Bodge’s “Soldiers in King Philip’s War,” the name of Richard Scott appears in such manner as to make quite certain the presence of two persons bearing that name. In those accounts, Richard Scott, cornet, and Richard Scott, private, were both paid for services, Aug. 24, 1676. The services extended from December, 1675, to Aug., 1676. From these accounts it also appears that John8 Scott served from June, 1675, to Aug., 1676. Richard’ Scott, the younger, who is mentioned, but not named, in his father’s letter to George Fox, no doubt perished, unmarried, in that terrible struggle. Hannah’s husband Walter Clark was born 1640 in Newport, Newport, Rhode Island. Walter died 23 May 1714 in Newport, Newport, Rhode Island. 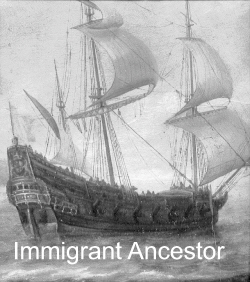 This entry was posted in 12th Generation, Dissenter, Immigrant - England, Immigrant Coat of Arms, Line - Miner, Storied, Violent Death, Wikipedia Famous and tagged Anne Hutchinson, Christopher Holder, Mary Dyer, Persecuted Quakers, Providence, Rev. Francis Marbury. Bookmark the permalink. Hi, I, too, am a direct descendant of Richard Scott. I have work from my cousin, Anna Rae Manges that takes the line back to Guido Baliol (born 986). Your page here is great Nice work. What is the pictured stone at the very top? Coat of Arms removed. In reality, Richard Scott was not part of the gentry and did not have a coat of arms.